, afterwards Von Linne‘, the most eminent of modern naturalists, was born at Rashult, in the province of Smaland, in Sweden, May 13th, 1707. His father, Nicholas Linnæus, was assistant minister of the parish of Stenbrohult, to which the hamlet of Rashult belongs, and became in process of time its pastor or rector; having married Christina Broderson, the daughter of his predecessor. The subject of our memoir was their first-born child. The family of Linnæus had been peasants, but some of them, early in the seventeenth century, had followed literary pursuits. In the beginning of that century regular and hereditary surnames were first adopted in Sweden, on which occasion literary men often chose one of Latin or Greek derivation and structure, retaining the termination proper to the learned languages. A remarkable Lindentree, Tilia Europæa, growing near the place of their residence, is reported to have given origin to the names of Lindelius and Tiliander, in some branches of this family but the above-mentioned Nicholas, is said to have first | taken that of Linnæus, by which his son became so exlen--“sively known. Of the taste which laid the foundation of his happiness, as well as his celebrity, this worthy father was the primary cause. Residing in a delightful spot, on the banks of a fine lake, surrounded by hills and valleys, woods and cultivated ground, his garden and his fields yielded him both amusement and profit, and his infant son imbibed, under his auspices, that pure and ardent love of nature for its own sake, with that habitual exercise of the mind in observation and activity, which ever after marked his character, and which were enhanced by a rectitude of principle, an elevation of devotional taste, a warmth of feeling, and an amiableness of manners, rarely united in those who so transcendantly excel in any branch of philosophy or science, because the cultivation of the heart does by no means so constantly as it ought keep pace with that of the understanding. The maternal uncle of Nicholas Linnæus, Sueno Tiliander, who had educated him with his own children, was also fond of plants and of gardening, so that these tastes were in some measure hereditary. From his tutor he learned to avoid the error of the desultory speculators of nature; and his memory, like his powers of perception, was naturally good, and his sight was always remarkably acute. He does not appear, however, to have been very happy under this tutor, and at seven years of age grammar had but an unequal contest with botany, in the mind of the young student. Nor was he much more fortunate when removed, in 1717, to the grammar-school of Wexio, the master of which, as his disgusted pupil relates,” preferred stripes and punishments to admonitions and encouragements.“In 1722 he was admitted to a higher form in the school, and his drier studies were now allowed to be intermixed and sweetened with the recreations of botany. 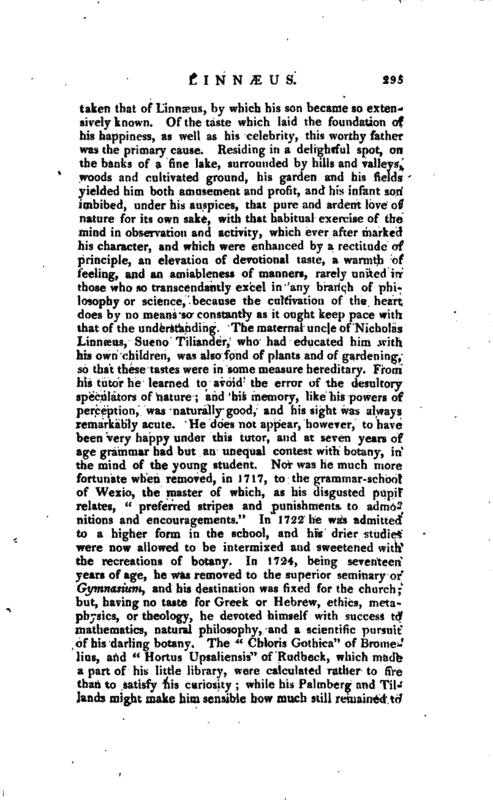 In 1724, being seventeen years of age, he was removed to the superior seminary or Gymnasium, and his destination was fixed for the church; but, having no taste for Greek or Hebrew, ethics, metaphysics, or theology, he devoted himself with success to mathematics, natural philosophy,and a scientific pursuit of his darling botany. The” Chloris Gothica“of Bromelius, and” Hortus Upsaliensis" of Rudbeck, which made a part of his little library, were calculated rather to fire than to satisfy his curiosity; while his Palmberg and Tillands might make him sensible how much still remained to | be done. His own copies of these books, used with the utmost care and neatness, are now in sir James Smith’s library. Linnæus’ s literary reputation, therefore, made so little progress, that his tutors havino pronounced him a dunce, he would probably have been put to some handicraft trade, had not Dr. Hothmann, the lecturer on natural philosophy, taken him into his own house, with a view to the studv of physic, and given him a private course of instruction in physiology. He first suggested to Linnæus the true principles upon which botany ought to be studied, founded on the parts of fructification, and put the system of Tournefort into his hands, in the knowledge of which he made a rapid progress. 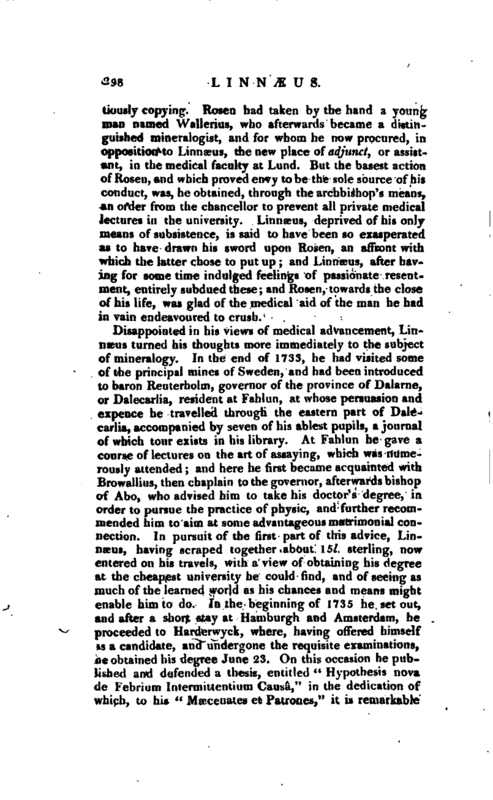 In 1727 Linnæus was matriculated at the university of Lund, and devoted himself to the study of medicine. He lodged at the house of a physician, Dr. Stobaeus, and haying accesfs to a library and museum of natural history, was indefatigable in his application, and Stobaeus being infirm in health and spirits, Linnæus was allowed occasionally to relieve him from the labours of his profession, and soon bocame a great favourite. 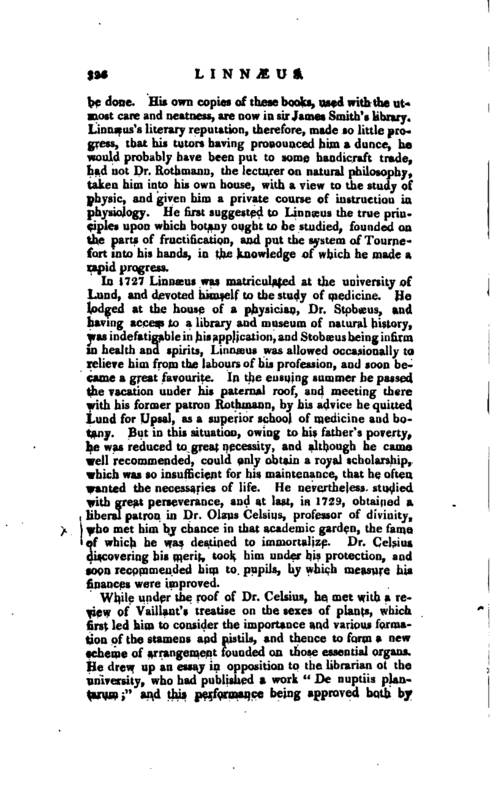 In the ensuing summer he passed the vacation under his paternal roof, and meeting there with his former patron Rothmann, by his advice he quitted Lund for Upsal, as a superior school of medicine and botany. But in this situation, owing to his father’s poverty, he was reduced to great necessity, and although he came well recommended, could only obtain a royal scholarship, which was so insufficient for his maintenance, that he often wanted the necessaries of life. He nevertheless studied with great perseverance, and at last, in 1729, obtained a liberal patron in Dr. Olaus Celsius, professor of divinity, who met him by chance in that academic garden, the fame of which he was destined to immortalize. Dr. Celsius discovering his merit, took him under his protection, and soon recommended him to pupils, by which measure his finances were improved. While under the roof of Dr. Celsius, he met with a review of Vaillant’s treatise on the sexes of plants, which first led him to consider the importance and various formation of the stamens and pistils, and thence to form a new scheme of arrangement founded on those essential organs. He drew up an essay in opposition to the librarian of the university, who had published a work “De nuptiis planturum i” and this performance being approved both by | Celsius and Rudbeck, led the way to his being appointed in 1730 to lecture in the botanic garden, as an assistant to Rudbeck. He was also taken into Rudbeck’s house as tutor to his younger children, and ms leisure time was employed on some of those botanical works which he afterwards published in Holland during his stay there. 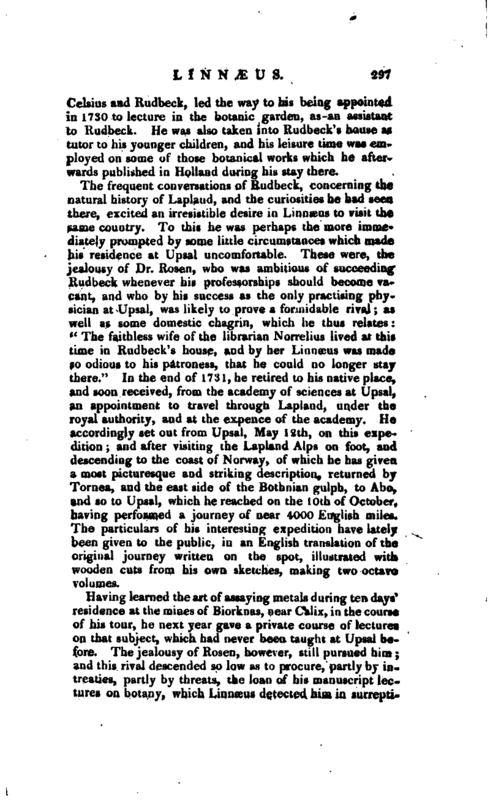 The frequent conversations of Rudbeck, concerning the natural history of Lapland, and the curiosities he had seen there, excited an irresistible desire in Linnæus to visit the same country. To this he was perhaps the more immediately prompted by some little circumstances which made his residence at Upsal uncomfortable. 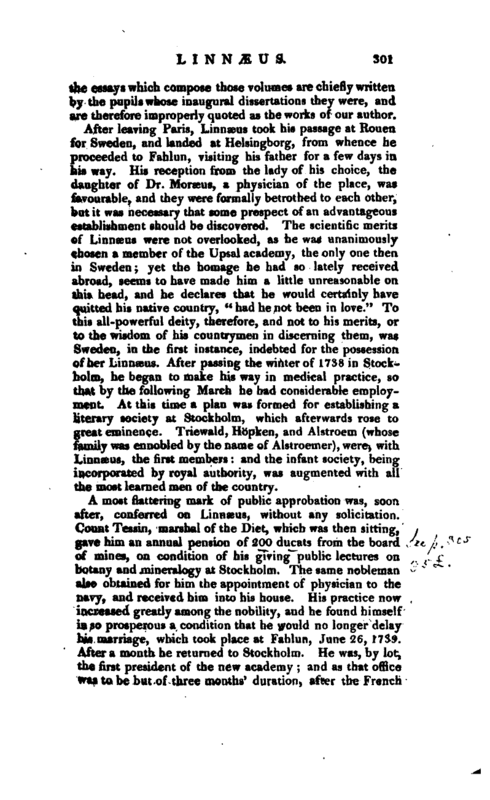 These were, the jealousy of Dr. Rosen, who was ambitious of succeeding Rudbeck whenever his professorships should become vacant, and who by his success as the only practising physician at Upsal, was likely to prove a formidable rival as well as some domestic chagrin, which he thus relates “The faithless wife of the librarian Norrelius lived at this time in Rudbeck’s bouse, and by her Linnæus was made so odious to his patroness, that he could no longer stay there.” In the end of 1731, he retired to his native place, and soon received, from the academy of sciences at Upsal, an appointment to travel through Lapland, under the royal authority, and at the expence of the academy. He accordingly set out from Upsal, May 12th, on this expedition; and after visiting the Lapland Alps on foot, and descending to the coast of Norway, of which he has given a most picturesque and striking description, returned by Tornea, and the east side of the Bothnian gulph, to Abo, and so to Upsal, which he reached on the 10th of October, having performed a journey of near 4000 English miles. The particulars of his interesting expedition have lately been given to the public, in an English translation of the original journey written on the spot, illustrated with wooden cuts from his own sketches, making two octavo volumes. Having learned the art of assaying metals during ten days’ residence at the mines of Biorknas, near Calix, in the course of his tour, he next year gave a private course of lectures on that subject, which had never been taught at Upsal before. The jealousy of Rosen, however, still pursued him; and this rival descended so low as to procure, partly by intreaties, partly by threats, the loan of his manuscript lectures on botany, which Linnæus detected him in | surreptitiously copying. 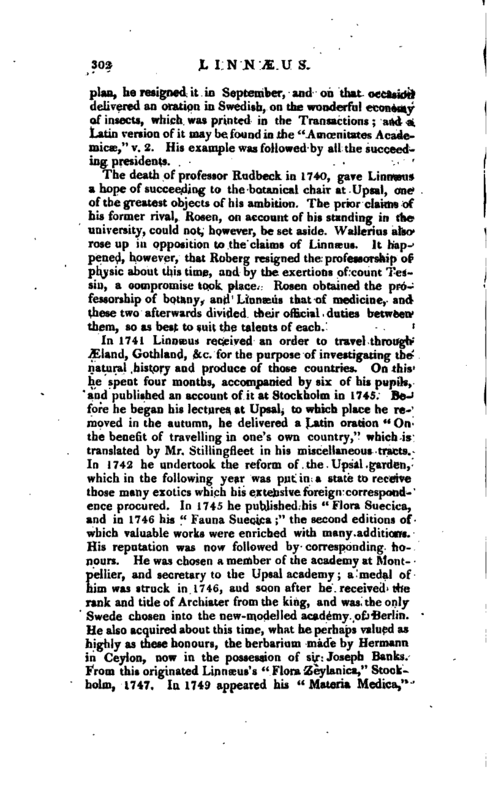 Rosen had taken by the hand a younginan named Wallerius, who afterwards became a distinguished mineralogist, and for whom he now procured, in opposition to Linnæus, the new place of adjunct, or assistant, in the medical faculty at Lund. But the basest action of Rosen, and which proved envy to be the sole source of his conduct, was, he obtained, through the archbishop’s means, an order from the chancellor to prevent all private medical lectures in the university. Linnæus, deprived of his only means of subsistence, is said to have been so exasperated as to have drawn his sword upon Rosen, an affront with which the latter chose to put up and Linnæus, after having for some time indulged feelings of passionate resentment, entirely subdued these; and Rosen, towards the close of his life, was glad of the medical aid of the man he had in vain endeavoured to crush. Disappointed in his views of medical advancement, Linnaeus turned his thoughts more immediately to the subject of mineralogy. In the end of 1733, he had visited some of the principal mines of Sweden, and had been introduced to baron Reuterholm, governor of the province of Dalarne, or Dalecarlia, resident at Fahlun, at whose persuasion and expence he travelled through the pastern part of Dalecarlia, accompanied by seven of his ablest pupils, a journal of which tour exists in his library. At Fahlun he gave a course of lectures on the art of assaying, which was numerously attended; and here he first became acquainted with Browallius, then chaplain to the governor, afterwards bishop of Abo, who advised him to take his doctor’s degree, in order to pursue the practice of physic, and further recommended him to aim at some advantageous matrimonial connection. In pursuit of the first part of this advice, Linnaeus, having scraped together about 15l. sterling, now entered on his travels, with a view of obtaining his degree at the cheapest university he could find, and of seeing as much of the learned world as his chances and means might enable him to do. In the beginning of 1735 he set out, and after a short stay at Hamburgh and Amsterdam, he proceeded to Harderwyck, where, having offered himself *s a candidate, and undergone the requisite examinations, ce obtained his degree June 23. On this occasion he published and defended a thesis, entitled “Hypothesis nova de-‘l’ebriuin Intermittentiuui Causa,” in the dedication of* vxiai.eh, to la’s “Alir.cenaios et Patrcmes,” it is reaiarlcublo | that, among the names of Rudbeck, Rothmann, StobacusV Moraius, &c. we find that of Rosen. The hypothesis here advanced, most correctly so denominated, is truly Boerhaavian. Intermitting fevers are supposed to be owing to fine particles of clay, taken in with the food, and lodged in the terminations of the arterial system, where they cause the symptoms of the disorder in question. In Holland Linnæus became acquainted with Dr. John Frederick Gronovius, who assisted him in publishing the first edition of the celebrated “Systema Naturie,” consisting of eight large sheets, in the form of tables; which edition is now a great bibliothecal curiosity. He also procured access to the illustrious Boerhaave, who encouraged him to remain in Holland; but this advice could scarcely have been followed, had he not met with a patron in Burmann, of Amsterdam, who was then preparing his “Thesaurus Zeylanicus,” and who received Linnæus into his house as his guest for some months, during which period he printed his “Fundamenta Botanica,” a small 8vo, which contains the very essence of botany, and has never been superseded or refuted. After he had been a few months under Burmann’s roof, he was introduced by Boerhaave toi Mr. George Clifford, an opulent banker, who had a capital garden at Hartecamp, and invited Linnæus to superintend it. 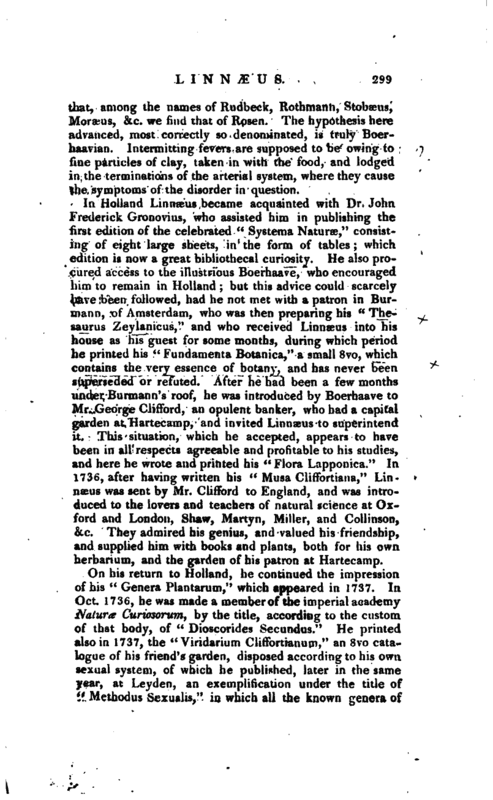 This situation, which he accepted, appears to have been in all respects agreeable and profitable to his studies, and here he wrote and printed his “Flora Lapponica.” In 1736, after having written his “Musa Cliffortiana,” Linnaeus was sent by Mr. Clifford to England, and was introduced to the lovers and teachers of natural science at Oxford and London, Shaw, Martyn, Miller, and Collinson, &c. They admired his genius, and valued his friendship, and supplied him with books and plants, both for his own herbarium, and the garden of his patron at Hartecamp. On his return to Holland, he continued the impression of his “Genera Plantarum,” which appeared in 1737. In Oct. 1736, he was made a member of the imperial academy Nature Curiosorum, by the title, according to the cdslom of that body, of “Dioscorides Secundus.” He printed also in 1737, the “Viridarium Cliffortianum,” an 8 vd catalogue of his friend’s garden, disposed according to his own sexual system, of which he published, later in the same year, at Leyden, an exemplitication under the title of “JYkthodus SexuaUs,” in which all’ the known genera of | plants are so arranged by name only. This year also he produced his magnificent “Hortus Cliffortianus,” folio. This splendid volume, which was printed by Mr. Clifford only for private distribution, was begun and finished in nine months. 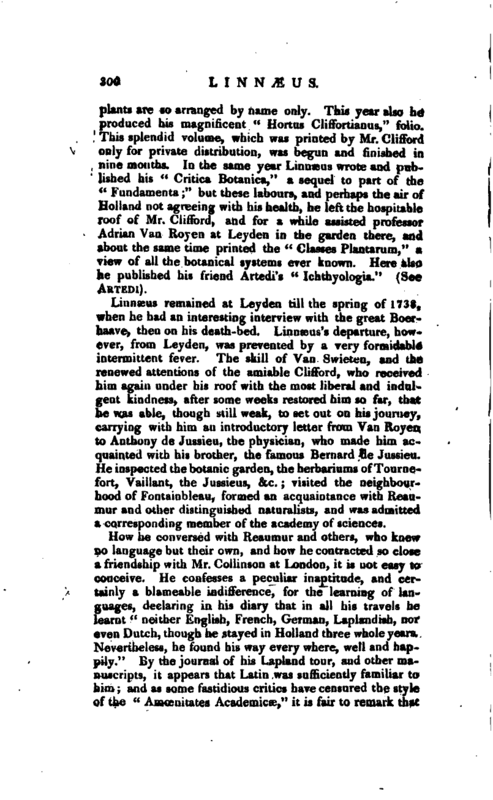 In the same year Linnæus wrote and published his “Critica Botanica,” a sequel to part of the “Fundamenta” but these labours, and perhaps the air of Holland not agreeing with his health, he left the hospitable roof of Mr. Clifford, and for a while assisted professor Adrian Van Royen at Ley den in the garden there, and about the same time printed the “Classes Plantarum,” a view of all the botanical systems ever known. Here also be published his friend Artedi’s “Ichthyologia.” (See Artedi). Linnæus remained at Leyden till the spring of 1738, when he had an interesting interview with the great Boerhaave, then on his death-bed. 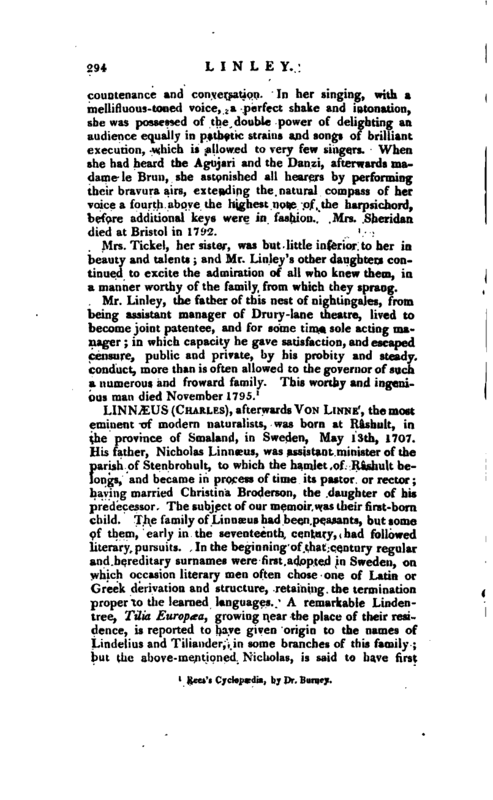 Linnæus’s departure, however, from Leyden, was prevented by a very formidable intermittent fever. 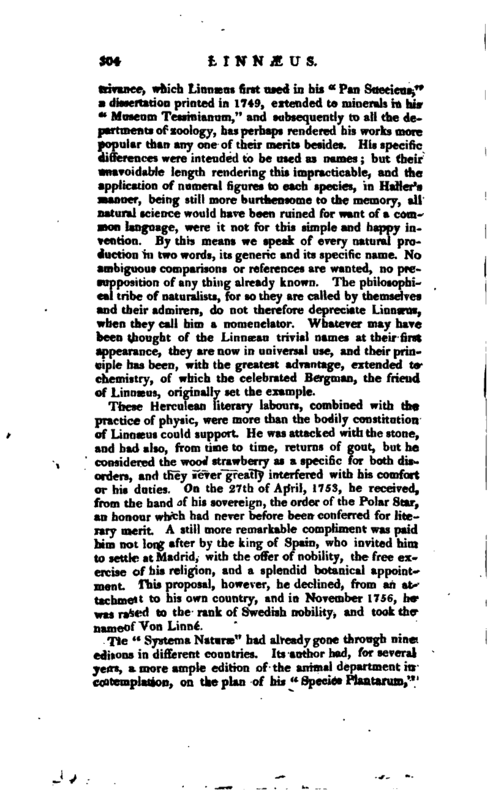 The skill of Van Swieten, and the renewed attentions of the amiable Clifford, who received him again under his roof with the most liberal and indulgent kindness, after some weeks restored him so far, that he was able, though still weak, to set out on his journey, carrying with him an introductory letter from Van Royen to Anthony de Jussieu, the physician, who made him acquainted with his brother, the famous Bernard de Jussieu. He inspected the botanic garden, the herbariums of Tournefort, Vaillant, the Jussieus, &c. visited the neighbourhood of Fontainbleau, formed an acquaintance with Reaumur and other distinguished naturalists, and was admitted a corresponding member of the academy of sciences. How he conversed with Reaumur and others, who knew no language but their own, and how he contracted so close a friendship with Mr. Collinson at London, it is not easy to conceive. He confesses a peculiar inaptitude, and certainly a blatneable indifference, for the learning of languages, declaring in his diary that in all his travels he learnt “neither English, French, German, Laplandish, nor even Dutch, though he stayed in Holland three whole years. Nevertheless, he found his way every where, well and happily.” By the journal of his Lapland tour, and other manuscripts, it appears that Latin was sufficiently familiar to him; and as some fastidious critics have censured the style of the “Amojniuues Academicae,” it is fair to remark that | the essays which compose those volumes are chiefly written by the pupils whose inaugural dissertations they were, and are therefore improperly quoted as the works of our author. After leaving Paris, Linnæus took his passage at Rouen for Sweden, and landed at Helsingborg, from whence be proceeded to Fahlun, visiting his father for a few days in his way. His reception from the lady of his choice, the daughter of Dr. Moraeus, a physician of the place, was favourable, and they were formally betrothed to each other, but it was necessary that some prospect of an advantageous establishment should be discovered. 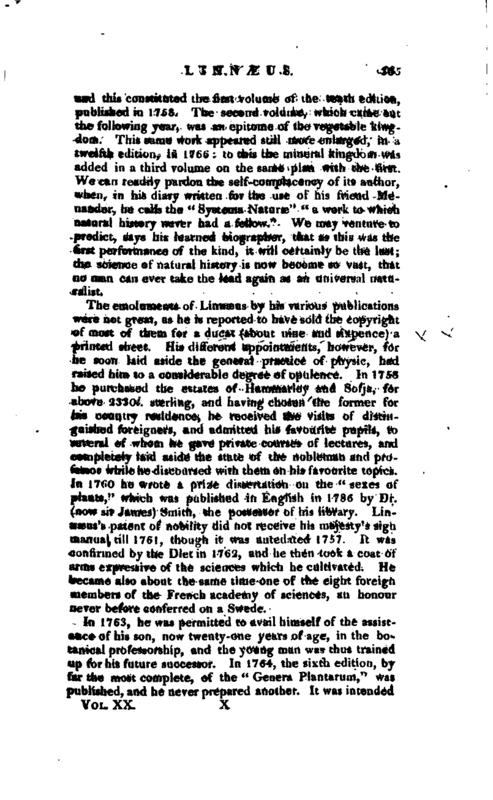 The scientific merits of Lmnseus were not overlooked, as he was unanimously chosen a member of the Upsal academy, the only one then in Sweden; yet the homage he had so lately received abroad, seems to have made him a little unreasonable on this head, and he declares that he would certainly have quitted his native country, “had he not been in love.” To this all-powerful deity, therefore, and not to his merits, or to the wisdom of his countrymen in discerning them, was Sweden, in the first instance, indebted for the possession of her Linnæus. After passing the winter of 1738 in Stockholm, he began to make his way in medical practice, so that by the following March he had considerable employment. At this time a plan was formed for establishing a literary society at Stockholm, which afterwards rose to great eminence. Triewald, Hopken, and Alstroem (whose family was ennobled by the name of Alstroemer), were, with Linnæus, the first members and the infant society, being incorporated by royal authority, was augmented with all the most learned men of the country. A most flattering mark of public approbation was, soon after, conferred on Linnæus, without any solicitation. Count Tessin, marshal of the Diet, which was then sitting, gave him an annual pension of 200 ducats from the board of mines, on condition of his giving public lectures on botany and mineralogy at Stockholm. The same nobleman also obtained for him the appointment of physician to the navy, and received him into his house. His practice novr increased greatly among the nobility, and he found himself in so prosperous a condition that he would no longer delay his marriage, which took place at Fahlun, June 26, 1739. After a month he returned to Stockholm. He was, by?lot, the first president of the new academy; and as that office was to be but of three months’ duration, after the Frenaji | plan, he resigned it in September, and on that occasion delivered an oration in Swedish, on the wonderful economy of insects, which was printed in the Transactions; and a Latin version of it may be found in the “Amoenitates Acadeniicae,” v. 2. His example was followed by all the succeeding presidents. The death of professor Rudbeck in 1740, gave Linnæus a hope of succeeding to the botanical chair at Upsal, one of the greatest objects of his ambition. The prior claims of his former rival, Rosen, on account of his standing in the university, could not, however, be set aside. Wallerius also rose up in opposition to the claims of Linnæus. It happened, however, that Roberg resigned the professorship of physic about this time, and by the exertions of count Tessin, a compromise took place. Rosen obtained the professorship of botany, and Linnæus that of medicine, and these two afterwards divided their official duties between them, so as best to suit the talents of each. In 1741 Linnæus received an order to travel through Æland, Gothland, &c. for the purpose of investigating the natural history and produce of those countries. On this Jhe spent four months, accompanied by six of his pupils, and published an account of it at Stockholm in 1745. Before he began his lectures at Upsal, to which place he removed in the autumn, he delivered a Latin oration “On the benefit of travelling in one’s own country,” which is translated by Mr. Stillingfleet in his miscellaneous tracts. In 1742 he undertook the reform of the Upsal garden, which in the following year was put in a state to receive those many exotics which his extensive foreign correspondence procured. In 1745 he published his “Flora Suecica, and in 1746 his” Fauna Suecica;“the second editions of which valuable works were enriched with many additions. His reputation was now followed by corresponding honours. He was chosen a member of the academy at Montpellier, and secretary to the Upsal academy; a medal of him was struck in 1746, and soon after he received the rank and title of Archiater from the king, and was the only Swede chosen into the new-modelled academy of Berlin. He also acquired about this time, what be perhaps valued as highly as these honours, the herbarium made by Hermann in Ceylon, now in the possession of sir Joseph Banks. From this originated Linnæus’s” Flora Zeylanica,“Stockholm, 1747. In 174U appeared his” Materia Medica,“| Written in. the same systematic and didactic style as-tlle? rest of his works. Of this numerous editions have heeti published on the continent, but none with any additions or corrections from the author himself, though he left ber hind him copious manuscript notes on the subject. In the same year he had a violent attack of the gout, which en-> dangered his life; and such was his anxiety to promote science, that he dictated from his bed-side, the manuscript of his” Philosophia Botanica," which afterwards received his own corrections, and was published in 1751. About this period the queen of Sweden, Louisa Ulrica, having a taste for natural history, which her- royal consort, king Adolphus Frederick, also patronized, shewed much favour to Linnæus. He was employed in arranging her collection of insects and shells, in the country palace of Drotningholm, or Ulricksdahl, and was frequently honoured with the company and conversation of their majesties, during his attendance there. The queen interested herself in the education of his son, and promised to send him to travel through Europe at her own expence. She also listened very graciously to any recommendation or petition, of Linnæus, in the service of science. 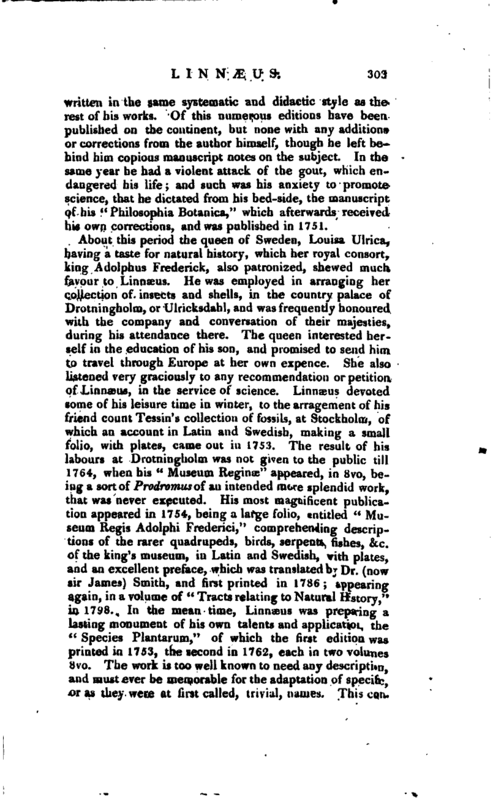 Linnæus devoted some of his leisure time in winter, to the arragement of his friend count Tessin’s collection of fossils, at Stockholm, of which an account in Latin and Swedish, making a small folio, with plates, came out in 1753. The result of his labours at Drotningholm was not given to the public [until] 1764, when his “Museum Reginse” appeared, in 8Vo, be-, ing a sort of Prodromus of an intended more splendid work, that was never executed. His most magnificent publication appeared in 1754, being a large folio, entitled “Museum Regis Adolphi Frederici,” comprehending descripr: tions of the rarer quadrupeds, birds, serpents, fishes, &c. of the king’s museum, in Latin and Swedish, with plates, and an excellent preface, which was translated by Dr. (now; sir James) Smith, and first printed in 1786; appearing, again, in a volume of “Tracts relating to Natural History,” in 1798. 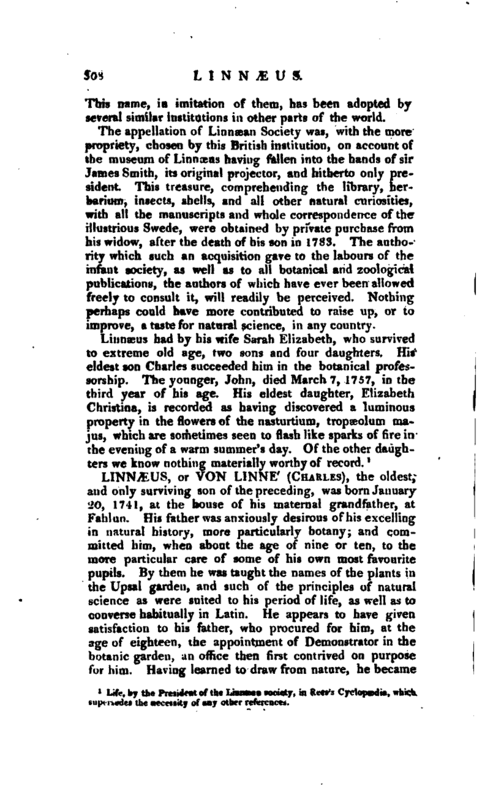 In the mean time, Linnæus was preparing a lasting monument of his own talents and application, the “Species Plantarum,” of which the first editiqn was primed in 1753, the second in 1762, each in two volumes S.vo. The work is too well known to need any description, and must ever be memorable for the adaptation of specific,­<5>ras they were at first called, trivial, names. This coa-, | trivance, which Linnæus first used in his “Pan Sueciciw,” a dissertation printed in 1749, extended to minerals in his “Museum Tessinianum,” and subsequently to all the departments of zoology, has perhaps rendered his works more popular than any one of their merits besides. His specific differences were intended to be used as names; but their unavoidable length rendering this impracticable, and the application of numeral figures to each species, in Haller’s manner, being still more burthensome to the memory, all natural science would have been ruined for want of a common language, were it not for this simple and happy invention. By this means we speak of every natural production in two words, its generic and its specific name. No ambiguous comparisons or references are wanted, no presupposition of any thing already known. The philosophical tribe of naturalists, for so they are called by themselves and their admirers, do not therefore depreciate Linnæus, when they call him a nomenclator. Whatever may have been thought of the Linnæun trivial names at their first appearance, they are now in universal use, and their principle has been, with the greatest advantage, extended to chemistry, of which the celebrated Bergman, the friend of Linnæus, originally set the example. These Herculean literary labours, combined with the practice of physic, were more than the bodily constitution of Linnæus could support. He was attacked with the stone, and had also, from time-to time, returns of gout, but he considered the wood strawberry as a specific for both disorders, and they never greatly interfered with his comfort or his duties. On the 27th of April, 1753, he received, from the hand of his sovereign, the order of the Polar Star, an honour which had never before been conferred for literary merit. A still more remarkable compliment was paid him not long after by the king of Spain, who invited him to settle at Madrid, with the offer of nobility, the free exercise of his religion, and a splendid botanical appointment. This proposal, however, he declined, from an attachment to his own country, and in November 1756, he was raised to the rank of Swedish nobility, and took the name of Von Linné". The “Systema Naturæ” had already gone through nine editions in different countries. Its author had, for several years, a more ample edition of the animal department in contemplation, on the plan of his “Species Plantarum,” | and this constituted the first volume of the tenth edition, published in 1758. The second volume, which came out the following year, was an epitome of the vegetable kingdom. This same work appeared still more enlarged, in a twelfth edition, in 1766: to this the mineral kingdom was added in a third volume on the same plan with the first. We can readily pardon the self-complacency of its author, when, in his diary written for the use of his friend Menander, he calls the “Systema Naturæ” “a work to which natural history never had a fellow.” We may venture to predict, says his learned biographer, that as this was the first performance of the kind, it will certainly be the last; the science of natural history is now become so vast, that no man can ever take the lead again as an universal naturalist. The emoluments of Linnæus by his various publications were not great, as he is reported to have sold the copyright of most of them for a ducat (about nine and sixpence) a printed sheet. His different appointments, however, for he soon laid aside the general practice of physic, had raised him to a considerable degree of opulence. In 1758 he purchased the estates of Hammarley and Sofja, for above 2330l. sterling, and having chosen the former for his country residence, he received the visits of distinguished foreigners, and admitted his favourite pupils, to several of whom he gave private courses of lectures, and completely laid aside the state of the nobleman and professor while he discoursed with them on his favourite topics. In 1760 he wrote a prize dissertation on the “sexes of plants,” which was published in English in 1786 by Dr. (now sir James) Smith, the possessor of his library. Linnaeus’s patent of nobility did not receive his majesty’s sign manual till 1761, though it was antedated 1757. It was confirmed by the Diet in 1762, and he then took a coat of arms expressive of the sciences which he cultivated. He became also about the same time one of the eight foreign members of the French academy of sciences, an honour never before conferred on a Swede. In 1763, he was permitted to avail himself of the assistance of his son, now twenty-one years of age, in the botanical professorship, and the young man was thus trained up for his future successor. In 1764, the sixth edition, by far the most complete, of the “Genera Plantarum,” was published, and he never prepared another. It was intended | as a companion to the “Species Plantarum,” but wai greatly superseded by the more concise and commodious short characters of genera, given in the vegetable part of the “Systema Naturae,” published with the title of “Systema Vegetabilium,” edition 13th, in 1774, and reprinted with additions in 1784. Although, as a physician, Linnæus appears to advantage in his “Clavis Medicinae” and his “Genera Morborum,” his abilities are more striking in his classification of natural objects. He excelled in a happy perception of such technical characters as brought together things most naturally allied. His lectures on the natural order of plants were published long after his death in 1792, at Hamburgh, and evince his deep consideration of a subject then in the infancy of cultivation. In the zoological department, his classification of birds and insects is the most original as well as the best of the whole. The arrangement of fishes was an original idea of Linnæus; and in the arrangement of shells, he has succeeded at least as well as any of his fellow-labourers: though we are, says his biographer, by no means inclined to justify some of his terms, which are borrowed from an anatomical analogy, not only false in itself, but totally exceptionable. This leads us to consider a charge, often brought against this great man, of pruriency of phraseology in many parts of his works. The most attentive contemplation of his writings has satisfied us that in such instances he meant purely to be anatomical and physiological; and if his fondness for philosophical analogies sometimes led him astray, it was not in pursuit of any thing to contaminate his own mind, much less that of others. That the mind of Linnæus was simple and chaste, as his morals were confessedly pure, is evinced by his Lapland Tour, written only for his own use, but which is now, as we have already mentioned, before the public. This is such a picture of his heart as will ever render any justification of his moral character, and any elaborate display of his religious principles or feelings, alike superfluous. 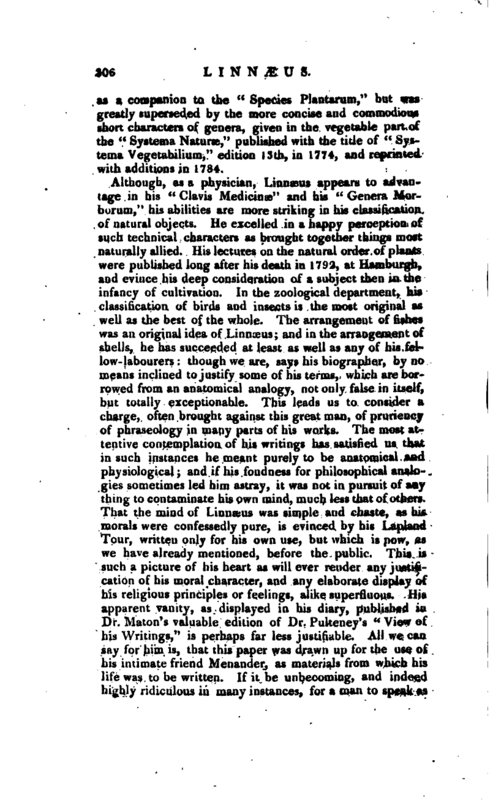 His apparent vanity, as displayed in his diary,published in Dr. Maton’s valuable edition of Dr. Pulteney’s “View of his Writings,” is perhaps far less justifiable. All we can say for him is, that this paper was drawn up for the use of his intimate friend Menander, as materials from which his life was to be written. If it be unbecoming, and indeed highly ridiculous in many instances, for a man to speak as | he does of himself, the justice and accuracy of his assertions, had they come from any other person, could in no case be disputed. As the habits of Linnæus were temperate and regular, he retained his health and vigour in tolerable perfection, notwithstanding the immense labours of his mind, till beyond his sixtieth year, when his memory began in some degree to fail him. In 1774, at the age of sixty-seven, an attack of apoplexy greatly impaired his constitution. Two years afterwards a second attack rendered him paralytic on the right side, and materially affected his faculties. The immediate cause of his death, which happened January 10th, 1778, in the seventy-first year of his age, was an ukeration of the bladder. His remains were deposited in a vault near the west end of the cathedral of Upsal, where a monument of Swedish porphyry was erected by his pupils. His obsequies were performed, in the most respectful manner, by the whole university, the pall being supported by sixteen doctors of physic, all of whom had been his pupils. 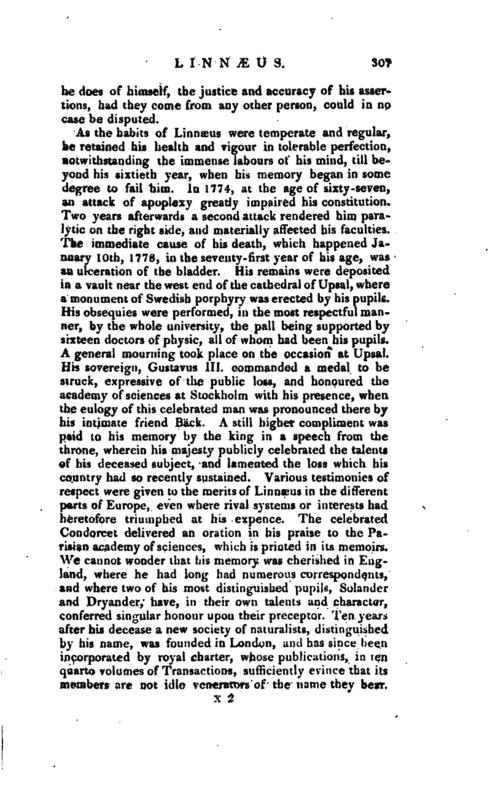 A general mourning took place on the occasion at Upsal. His sovereign, Gustavus III. commanded a medal to be struck, expressive of the public loss, and honoured the academy of sciences at Stockholm with his presence, when the eulogy of this celebrated man was pronounced there by his intimate friend Back. A still higher compliment was paid to his memory by the king in a speech from the throne, wherein his majesty publicly celebrated the talents of his deceased subject, and lamented the loss which his country had so recently sustained. Various testimonies of respect were given to the merits of Linnæus in the different parts of Europe, even where rival systems or interests had heretofore triumphed at his expence. The celebrated Condorcet delivered an oration in his praise to the Parisian academy of sciences, which is printed in its memoirs. We cannot wonder that his memory was cherished in England, where he had long had numerous correspondents, and where two of his most distinguished pupils, Solander and Dryander, have, in their own talents and character, conferred singular honour upon their preceptor. Ten years after his decease a new society of naturalists, distinguished by his name, was founded in London, and has since been incorporated by royal charter, whose publications, in ten quarto volumes of Transactions, sufficiently evince that its members are not idle venerators of the name they bear. | This name, in imitation of them, has been adopted by several similar institutions in other parts of the world. The appellation of Limuean Society was, with the more propriety, chosen by this British institution, on account of the museum of Linnæus having fallen into the hands of sir James Smith, its original projector, and hitherto only president. This treasure, comprehending the library, herbarium, insects, shells, and all other natural curiosities, with all the manuscripts and whole correspondence of the illustrious Swede, were obtained by private purchase from his widow, after the death of his son in 1783. The authority which such an acquisition gave to the labours of the infant society, as well as to all botanical and zoological publications, the authors of which have ever been allowed freely to consult it, will readily be perceived. Nothing perhaps could have more contributed to raise up, or to improve, a taste for natural science, in any country.